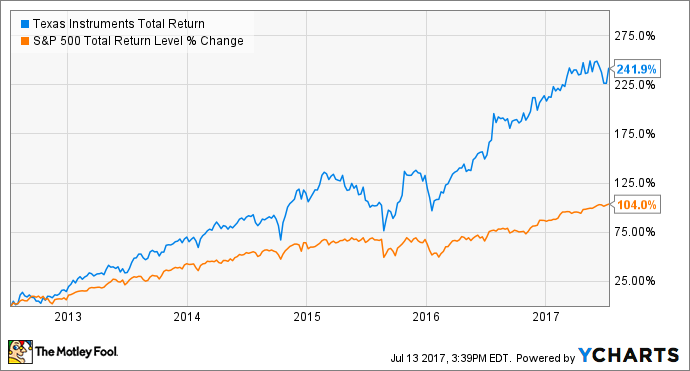 3 Great Reasons to Buy Texas Instruments, Inc. Interested in shares of this analog semiconductor veteran? Here are three attractive reasons to add this stock to your portfolio. You know Texas Instruments (NASDAQ:TXN) as a maker of analog and embedded semiconductors. The company is also a household name in calculators and educational technology tools, and its DLP products may have powered your large-screen TV set before LCD and plasma flat-screens took over that market. But have you ever considered investing in the company behind all of these well-known products? Here are three solid reasons why Texas Instruments might belong in your portfolio today -- or at least on your watchlist for further research. I already mentioned the many sectors in which you'll find TI collecting revenue. Analog and embedded processors account for about 80% of the company's annual sales, and those products turn up absolutely everywhere. You'll find TI processors in smartphones, garage door openers, security systems, and network switches. In modern cars, TI chips power parts of the in-car infotainment systems, help manage engine timings, and connect the various components of our increasingly digital vehicles to each other. The company serves more than 100,000 customers worldwide. That's device builders, not end-market consumers. TI also makes more than 100,000 different embedded and analog processors, developed and supported by 31,000 employees in 35 countries. This company is essentially immune to downturns in any particular market, as it can make up for, say, weakness in tablet sales or industrial lighting with stronger sales in set-top boxes and telecom-grade networking chips. The same diversity also limits TI's ability to benefit from sudden surges in any particular field. But keep in mind that the company's management and sales teams have the ability to adjust as market conditions change, always pursuing growth opportunities as they appear while limiting exposure to unprofitable segments. At the moment, TI's most important target markets are found in automotive computing and industrial control tools. These are large, growing, and healthy markets with solid long-term prospects. TI is smart to emphasize them, and shareholders will continue to benefit as management bobs and weaves to find the next big growth market. TI has a history of making more money than analysts and investors were expecting. The company has exceeded Wall Street's earnings estimates in each of the last seven quarterly reports by an average of 11%. The average revenue surprise for the same period was 3%. These are the telltale signs of a strong management team. Forecasts almost always err on the side of caution and investors are kept in the loop. The company used to provide a unique midquarter update of guidance targets, but discontinued the practice in 2014. Why? Because TI's business had diversified to the point that the updates could only narrow management's financial targets down to the midpoint of the original forecasts. Hardly worth the trouble to prepare official updates and conference calls with analysts, when all you're saying is that things are working out exactly like we already told you. The company's top-line revenue may not show a whole lot of growth, but TI is a well-oiled generator of generous profits. Based on $13.8 billion of trailing revenues, TI collected $3.9 billion in net income and $4.2 billion of free cash flow. EBITDA profits stopped at $6.3 billion. In other words, the company keeps about one-third of its incoming sales in the form of GAAP and cash profits. What's more, TI's management is pretty serious about returning most of these cash profits to shareholders. The company paid out $1.8 billion of dividend checks over the last four quarters along with $1.5 billion in net share buybacks, out of $4.2 billion in free cash flows. That's 76% of TI's cash flows heading right back to investor pockets. And that's an off year -- the ratio of buybacks plus dividends over free cash flows stood at 80% in 2016 and 101% in 2015. Yep, TI sometimes dips into its cash reserves to keep the buybacks coming and dividends growing. The S&P 500 market barometer has doubled in five years on a dividend-adjusted basis. Texas Instruments more than tripled over the same period, boosted by those solid cash returns and stabilized by its diversity. TXN Total Return Price data by YCharts.